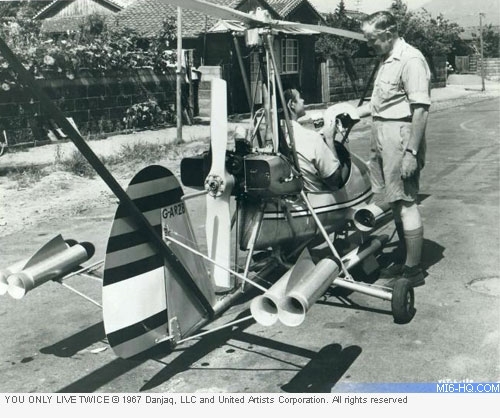 Designed by Wing Commander Ken Wallis, the autogyro Little Nellie differs from the helicopter in that it has a upwards thrusting propeller and a second prop to drive the forward. The gyro's upward's prop lifts air much the same as a glider. The first autogyro was invented by Juan de la Cierva in 1921, Spain, when he was looking to develop a light and fast bomber for the Spanish military. It's first successful flight was not until 1923, however. The gyro created by Wallis runs on the same principles as that built by Cierva but it much smaller and more nimble. His gyros were put into service for both military and recreational purposes. Little Nellie is a Wallis WA-116 but since her duties on the "You Only Live Twice" mission, Wallis developed models 117-21. Little Nellie was kitted out with a range of armourments by MI6's Q-Branch, so that Bond could survey the volcanic islands of Japan in safety. She was accompanied by her "dad", Q himself, who demonstrated some of the modifications to 007. Such modifications included twin forward-facing machine guns, two 1.75" rockets, smaller heat seeking missiles and areal mines. Nellie is equipt with short-range radio so that the pilot can communicate with her "dad" at all times, and a camera broadcasts a pilot's view so that he can better be aided by the ground-staff. She is transported to Japan in several packing cases and assembled by able bodies provided by the Japanese secret service - overseen by Q of course. 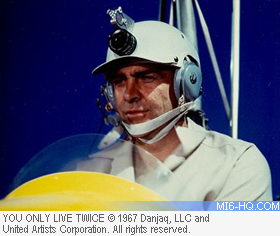 Above: Q shows 007 over the aircraft, imploring him to be careful with the equipment. Bond sets off in search of a locale from which the space saboteurs could be launching their rogue rockets, only to receive a hot reception from a couple of big hot-shots. Nellie defends her honour admirably by dispatching with a number of larger SPECTRE helicopters. 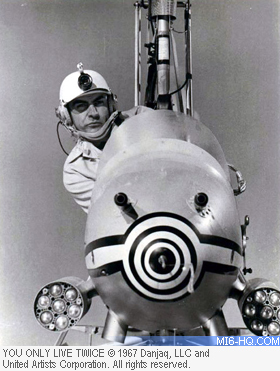 Right: James Bond pilots Little Nellie in an aerobatic duel with several bigger choppers.